Starting skills in Sekiro Shadows Die Twice are very important, and you definitely want to get the best starting skills. Otherwise, you might find yourself in trouble because the skills you’ve chosen aren’t doing enough to help you. True, most Sekiro starting skills are relatively equally useful, but there are a few that are borderline non-negotiable, when it comes to the best skills. With that in mind, here’s our Sekiro Best Starting Skills guide to show you which skills to choose in the beginning of the game, based on our experience. Which Starting Skills to Choose in Sekiro? 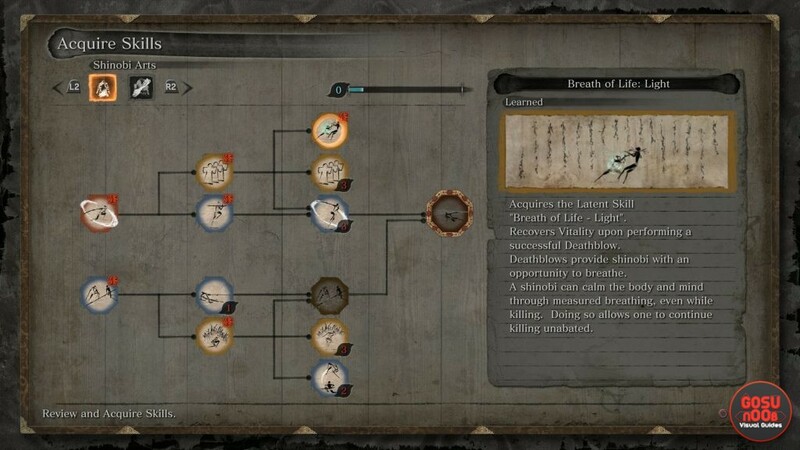 The first starting skill in Sekiro Shadows Die Twice is the Mikiri Counter, in the Shinobi Arts skill tree. This one is going to be absolutely vital for you. Basically, you have to hit the Dodge button the milisecond the red symbol appears as the enemy attacks, with the analog stick towards them. Your character will jump onto the enemy’s weapon, reducing the distance and opening the enemy for a death blow. It saved our skins quite a bit. The only thing you keep in mind is that this skill doesn’t seem to work with slashing attacks, only thrust attacks. The second absolutely invaluable skill to unlock is Breath of Life: Light, also in the Shinobi Arts tree. And, of course, all the skills leading up to it, like Whirlwind Slash and Shinobi’s Karma: Body, which also come in handy. However, the reason Breath of Life: Light is an absolutely necessary pick is that it restores a little bit of health for every Death Blow you deal. Sounds good, right? It is. You can basically use this ability to replenish your health by killing easier mobs, on the go, and save your Gourd for when it really get’s hairy. Other skills you might want to consider include Suppress Presence and Sound, to enhance your Stealth, Grappling Hook Attack, Emma’s Medicine: Potency, Ichimonji, Mid-Air Deflection, and maybe Shinobi’s Karma: Mind. That’s basically up to you and your playstyle. However, Mikiri Counter and Breath of Life: Light we recommend very highly. So, those are some of the best starting skills to choose in Sekiro: Shadows Die Twice. In case you need help with anything else, we have a whole bunch of other Sekiro guides for you to check out, including Unseen Aid – How to Get & Increase Chance and Prayer Bead Locations.